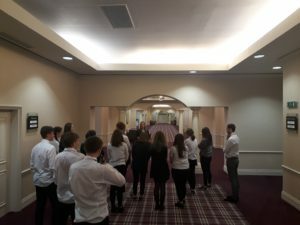 We had 15 pupils from Websters High School in Kirriemuir visit St. Andrews to gain a greater understanding of careers and pathways within the Hospitality and Tourism sectors. In the morning we visited the VisitScotland ICentre in St. Andrews. We heard a talk from Claire Lambie, Assistant Area Manager, who told us about the ICentres and where they sit in the VisitScotland outlook. The pupils were split into teams and given a task to think of as many jobs as they can which would be supported by, or involved in, tourism. The second group were asked to think about what services and amenities tourists need and want while on holiday and what they spend money on. We then had a talk from Chris Greenwood, Senior Tourism Insight Manager. He told us that Scottish tourism is worth £4 billion to the economy, however, if you take a holistic view and include all the peripheral and supporting businesses, the figure would be £11 billion. He talked about how businesses involved in tourism are spread throughout Scotland and there are opportunities to set up your own business where ever you are based and that there is a national target to grow the tourism sector by 2020. 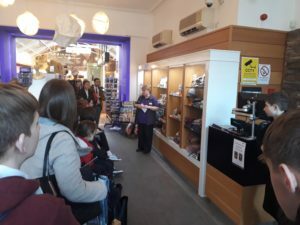 We heard from some of the other ICentre staff who talked about things like buying from local suppliers and the outreach supplier events that they run, where local businesses such as hotels and distilleries come into the centre to present their products and services. They hold about 7 of these a year and as many as two thousand people attend these over the day. This helps to encourage both locals and visitors to use local businesses and invest in the local economy. We spoke about the variety of people that visit the centre and how this is a positive for the staff as they meet so many new people. 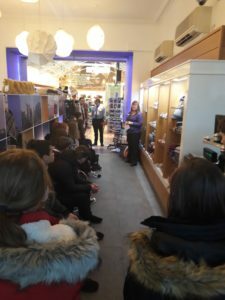 The pupils were again split into groups and carried out an activity where they had to look around the shop and surmise what were the best-selling items there. The groups enjoyed this and guessed correctly! 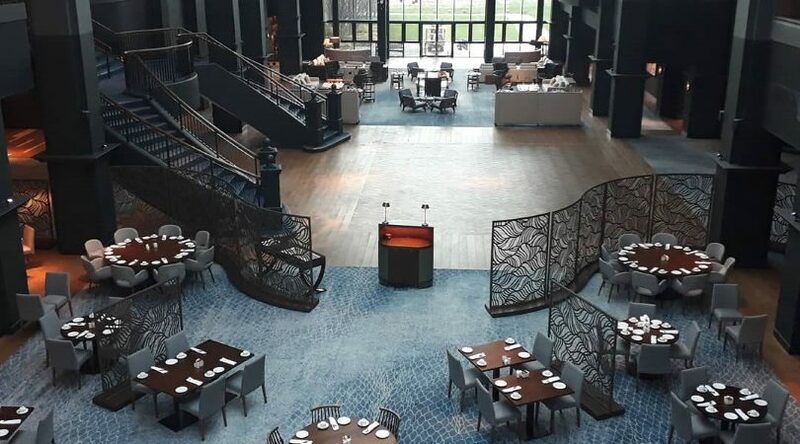 We then moved onto the Fairmont Hotel just outside of St. Andrews. The pupils found this a really inspiring visit as many of them had not visited a 5-star hotel before. We were given a tour of the hotel and discussed the different types of jobs that would be available within that setting. The pupils heard about the Modern Apprenticeship (MA) programme that the hotel runs. The apprentices gain insight into every area of the business as they rotate round each area of the hotel every six-months. They get experience in the reception, spa, restaurant, golf course and more. The training and qualifications they receive from this mean they are knowledgeable and work ready and can work immediately in any setting and sought after by many different employers. The hotel staff were happy to answer questions that the pupils had about the Hotel and the industry as a whole. The pupils left feeling enthused and some were interested in working in Hospitality and Tourism as a career. Experiences like this are invaluable for young people and businesses alike. When the pupils returned to school they requested time in the library looking up and exploring careers in the tourism and hospitality industry, specifically the apprenticeship frameworks and opportunities that were available to them. Young people need real-life and hands-on experiences to broaden their horizons and become aware of the huge range of careers that are available to them. The hospitality & tourism sector is one of Scotland’s largest employers and a key factor in our GDP, this is particularly true in the Tayside region. Despite this young people have very little knowledge of opportunities available to them, the pathways (including Graduate Apprenticeships which allow young people to earn while they learn and receive a bachelor’s degree), the careers, the salaries and what job roles consist of. By going to visit the ICentre and Fairmont the pupils gained contextualised, relevant and accurate information, from local professionals and had the opportunity to ask questions. They didn’t just read a statement from the internet. VisitScotland and the Fairmont were able to showcase their industry and their own careers, particularly their apprenticeship opportunities. They could promote themselves as employers and encourage a large group of young people to view their industry as the incredible employment opportunity it is. If you are interested in offering a visit to your business or engaging with local young people, please don’t hesitate to get in touch and DYW Dundee & Angus can support you throughout – contact@dywda.co.uk.